If you didn’t already know about Daft Punk, chances are that you’re pretty familiar after the French DJ duo silently accepted five Grammys last night—including Record of the Year and Album of the Year. Of course, with the way that their smash hit “Get Lucky” was omnipresent on radio and playlists alike during 2013, you were probably already more than acquainted. What you may not know: Daft Punk has their own F1 car. Apparently, that’s the answer to the age-old question of what you can get for the man (robot?) who has everything. When you’ve got a multi-platinum record, a number of Grammy awards, had Stephen Colbert craft a genius dance-off sketch around your hit single, and have been flanked by no less than Nile Rodgers and Smokey Bear bestie/Arby’s shill Pharrell (seen below, because I can’t resist), the only thing left to do is team up with Lotus F1 and put your brand on a really fast car. The Daft Punk F1 car was first revealed back in May around the time when Random Access Memories released and forever changed the way we objectively viewed our sleep patterns. 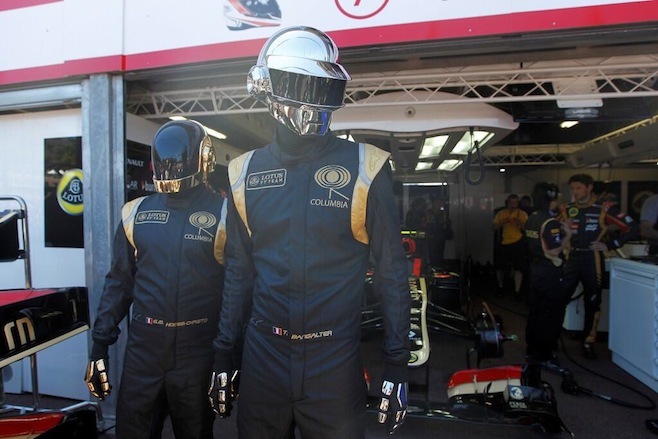 The Daft Punk F1 car, piloted by Romain Grosjean, made its debut at the Grand Priz de Monaco back on May 26. The Daft Punk robots—otherwise known as Thomas Bangalter and Guy-Manusel de Homem-Christo—cheered their car and driver on from a balcony, witnessing a crash that forced it out of the race. Perhaps they had failed to stay up all night, and thusly, were unable to get lucky. Guess they didn’t make that same mistake twice. Check below for some photos of the Daft Punk F1 car and its namesake (photos courtesy of the Lotus F1 Team’s Twitter and a lot of back-scrolling).